investment services. retirement plans. insurance. Get your financial house in order with some spring cleaning. Dave gives some great tips to help you get started! Joe, owner of Stack-Tech IT Services & Computer Repair, discusses best practices for preventing identity theft, hackers, and scammers. Also, find out how to safely store all your passwords. The opinions expressed are for general information only and are not intended to provide specific advice or recommendations for any individual. All entities are separate and not affiliated with LPL Financial. The following basic rules can help you make smarter choices regardless of whether you have some investing experience or are just getting started. The opinions voiced n this material are for general information only and are not intended to provide specific advice or recommendations for any individual. David J. Workman of Workman & Associates was recently ranked No. 22 in Indiana in the annual Best-In-State Wealth Advisors list published by Forbes. According to Forbes, the annual list highlights over 2,000 of the nation’s top-performing advisors, nominated by their firms and then evaluated based on a qualitative algorithm and quantitative criteria administered by SHOOK Research. The criteria includes interviews, industry experience, community involvement, revenue trends and client retention*. Workman & Associates is based in Logansport, Indiana, and provides access to a full range of financial services including retirement and financial planning, small and large company retirement plans, fee-based planning, individual stocks and bonds, mutual funds, traditional and Roth IRAs, annuities, life insurance, long-term care insurance, 529 college savings plans, and more. He has served Indiana for over 20 years and is licensed in 29 states. He and his wife, Beth, who has helped him run the business since inception, have 3 adult children (all married and living in central Indiana) and 1 grandchild. 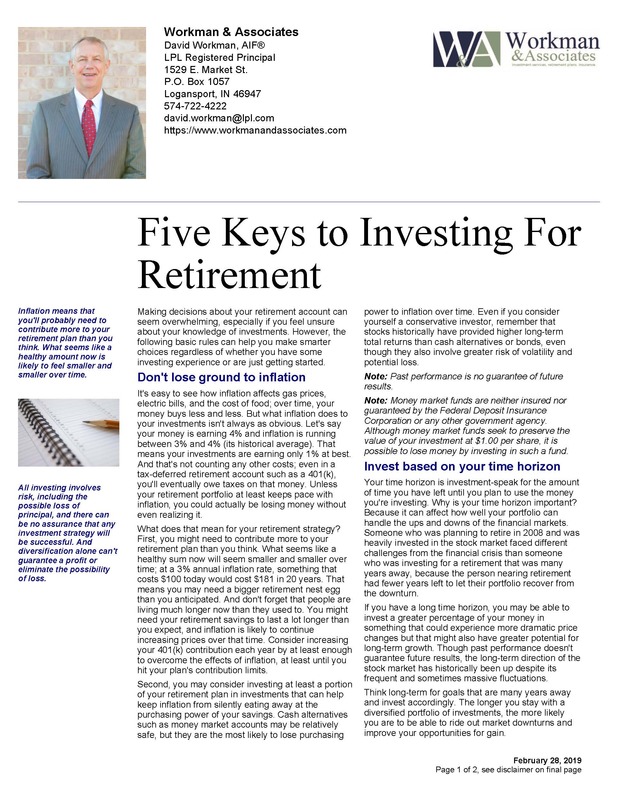 David Workman is an LPL Financial advisor. LPL is the nation’s largest independent broker-dealer** and a leader in the retail financial advice market, providing resources, tools and technology that support advisors in their work to enrich their clients’ financial lives. * The Forbes Best-In-State Wealth Advisor ranking, developed by SHOOK Research, is based on in-person and telephone due diligence meetings and a ranking algorithm that includes: client retention, industry experience, review of compliance records, firm nominations, and quantitative criteria, including: assets under management and revenue generated for their firms. Portfolio performance is not a criterion due to varying client objectives and lack of audited data. Neither Forbes nor SHOOK Research receives a fee in exchange for rankings. LPL Financial, Forbes magazine and SHOOK Research are all separate entities. NFIB is not affilliated with LPL Financial or Workman & Associates.